Startup Iceland - Building a vibrant, sustainable and antifragile entrepreneurial ecosystem in Iceland - Nassim Hussain Taleb – oh why oh why did I not read him earlier! 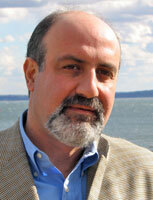 Nassim Hussain Taleb – oh why oh why did I not read him earlier! I have been listening to Fooled By Randomness by Nassim Nicholas Taleb a derivatives tra der who has been calling all the statistical models used by banks as inadequate to manage risk. I think it is high time all “Risk Managers” take notice and do something about their infalliabilities. Lets be honest, we don´t have a clue when it comes to predicting the improbable event… heck we even argue about the premium we have to pay for our life insurance given the event of untimely death the argument to get a deal on life insurance was just a waste of breath! In following Taleb´s chain of thought I have been doing more reading about his work (I still have the Black Swan to read), here is a very interesting article about “The Fourth Quadrant” – his hypothesis of mapping the improbable event, do we really care it is a subprime crisis or the US dollar bust? Well, I think we need to start buying insurance for the fact that the US dollar could go bust… improbable you say? Think again… time and time again we have pushed aside thoughts our brain is not built to fathom but then again atleast the thing I want to get out of understanding this concept is that we humans are built this way, so lets not take ourselves too seriously when we know that “something is absolutely” the truth. Read his interview on calling the models all Banks relied on – Value At Risk or VAR models as total BS! what amazes me is that he was calling this bogus in 1996! I wish I had read his work before, but hey I got into banking only two years back so I am a faster learner than most of the Bank Risk Managers I know. My lessons from the reading, accept the Randomness in our lives and make sure you have insurance cover when the S#$% hits the fan!